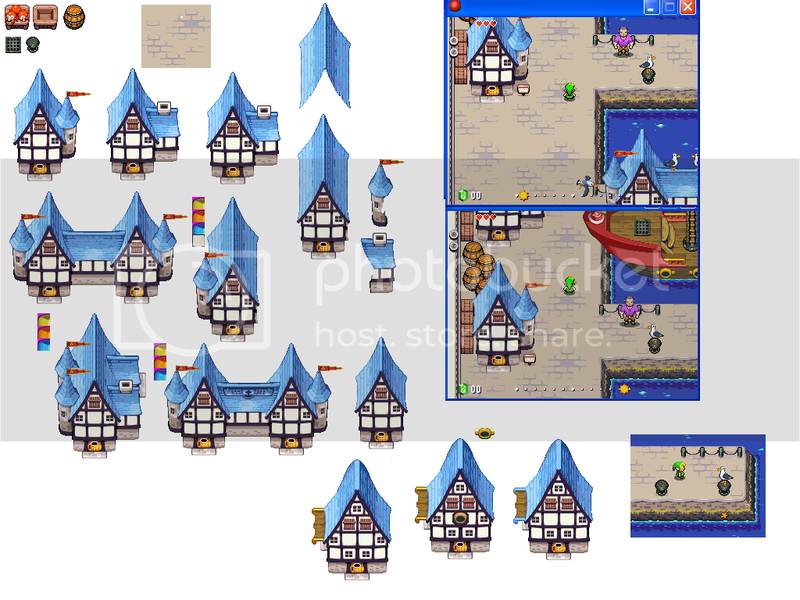 I was bored and decided to put together an Ice Dungeon Tileset. I used the tiles from Talus Cave and Death Mountain from Four Swords, and the tiles from the Temple of Droplets from MC to make this. The idea is that the walls are made of pure ice, and so would the floor. There could also be snow as normal floor, instead of having all the floor be ice. I found a screenshot of the cancelled game Midora that had these spiky plants crawling out of a temple, that looked exactly like the tentacles of Phytops from Spirit Tracks. I decided to get a piece of that plant, edit, recolor it, and animate it to look like a tentacle to have them be the tentacles from the Phytops we did a while back. This is the result. Recruitment / Re: Looking for a team of spriters to help with an original game. If anyone is interested with sprinting send me a PM and I'll let Moffett know, since I am very active here. I quickly whipped up some stone foundations based on the bottom of King Mob's houses, there's a couple bits of stone to suggest rubble. Creating ruins of the wooden parts of the houses would be more difficult, but maybe you can put some broken planks around to imply that the wooden parts have since fallen down too. In Minish Cap there was a sidequest where you had to build houses for the Oracles. They did have a sprite for a semi constructed house, which is just wooden planks. I believe you can use that to make what you want. I hope it helps. Yeah, use it! That's why I make the sprites in the first place, so they get implemented in a fan-game. I'm glad you are enjoying animating my sprites its awesome to see them animated. I made the Shrines from Breath of the Wild. I used Leduardo's Sheikah logo from his sprite. to make the sprite I got the image from here. Nice! I made Twilight Princess Link teleport animation. The palette used. I never understood why they were brown when Biggoron and every other goron in previous games were yellow-ish, heck even in BotW they are yellow. In Wind Waker, which style is practically Minish Cap in 3D, the gorons were still yellow. The front, side and back view all are completely independent, they don´t line up in height. For the side view the arms are longer, the legs and feet are thinner than the front view, as the feet on the front view look extremely large, and on the back view the goron is just shorter than the other two sides. I put a size comparison on the attachment so you see what I mean. Then the eyes are on the front view shaded while on the side view its one plain color. I know what you mean when you say the feet should be hidden, but i've never personally liked that, you hardly see anything, which I guess its why they made the feet so large in MC. I also made the Goron cross his arms using the Goron Chief sprite from King Mobs's Shadowgazer. Yeah, I have the colors for the dark skinned ones, I'll edit this post with them when I get home. And go ahead and edit them if you like! I believe we should all work together to make these sprites! Daruk is quite big in the game xD As for the color, I did see that the third color was too bright, so I skipped that one. basically I used the first, second, fourth and fifth colors of Biggoron. The perspective looks alright to me. It seems I get the perspectives wrong since people point them out all the time, is there a way for me to get them right? any pointers? As for Link, I like your edits, but I do believe link in MC is supposed to be "Child Link", while in Botw he is an adult. EDIT: I also found these, but I don´t remember who make them.